I don't. And I'd hazard a guess that you don't either, Bot. While, sure, I tend to read some sources more than others, I do deliberately look outside my own circle, my own beliefs and my own bubble to hold up an issue and examine it from every angle in good light. As a teacher (and a thinking person) I want to take info from several sources to form what I hope to be an informed and thoughtful opinion. p.s. I think your captcha just called me something rude in Vietnamese. Whiskey, by "we", I meant everyone except you and me. Seriously, I agree that many people sincerely work to form opinions by considering new information that is outside the bounds of what they currently know and believe. I was thinking more about our general day-to-day experience of life vs. how we choose to research particular topics. Deleted a comment that ventured far too far off point. Okay, fair enough. I was thinking purely search and clicking online behavior, re: Pariser. In my day to day offline life, I concede that I likely stay mostly within my comfort zone and my own beliefs, in general. However, I would argue: how easy is it really, to step outside our current beliefs and comforts? Is it as simple as attending a new church, seeking out different cultures to mingle with, or listening to new and different people's viewpoints? I don't think any of those things are all that simple to do. Who has the TIME? Who has the energy, the resources to constantly seek and search for new and different? Unless your job is in research or academia, it's not as simple as it sounds. In the physical, day to day world, it's difficult to venture too far outside our normal comfort zone, if only logistically. It's not easy to go out and find those things. Online, however, it's far easier to take in different opinions, new viewpoints, and learn about new ideas. All in the comfort of my own zone. I am currently working on crossover ideas or mashup concepts as new means of using current knowledge in different ways. It's the lazy man's way to innovate as you don't have to learn anything new. Just take two of the things you know about that you wouldn't normally think about at the same time and put them together and see what happens. Like combining a kangaroo and a sheep would give you a woolly jumper. 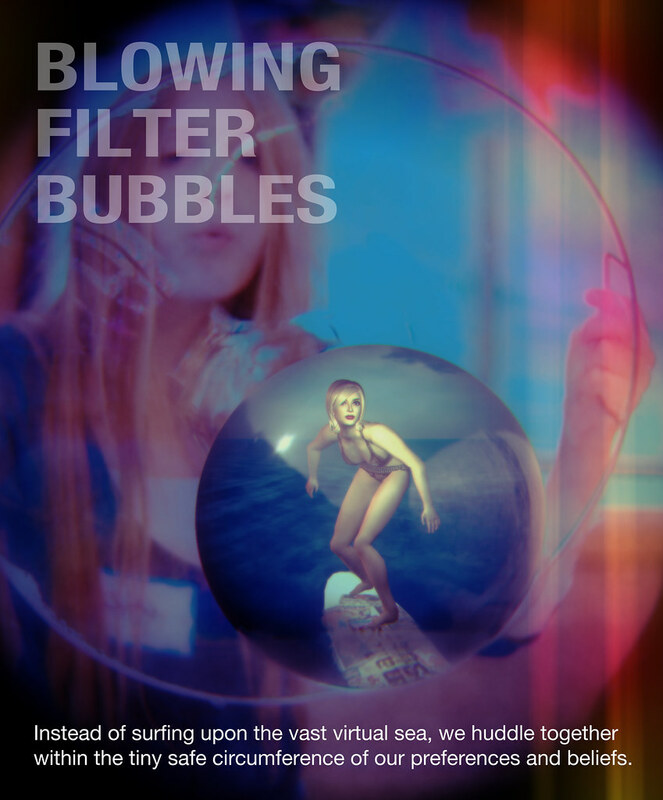 I think the filter bubble is an inescapable aspect of the human condition. Our finite time and resources are no match for the infinite depth and scope of reality. It's like we're walking around in the pitch dark with a little flickering candle. Since I don't believe we can completely escape subjectivity, it would be fair to ask why I brought this idea up in the first place. The reason is that if we can keep in mind that we're ALWAYS in a filter bubble, it's possible to chip away at our ignorance in the areas that will have the most substantive impact on our lives. I agree that no one has the time or energy to constantly push past the boundaries of understanding and comfort in every area of their current lives, let alone in every area of LIFE. One reason I keep blogging is that it continuously confronts me with gaps, limitations and errors in my own understanding as I try to take a half-baked idea and figure out how to communicate it. Like you, I really value virtual communication. It gives my tortured INTP (Myers Briggs) soul a comfortable environment to interact within. Anyway, thanks for the thoughtful comment. I love mashups too. One thing I've been playing around with recently is photographing odd combinations of action figures, like Neo from the Matrix with Homer Simpson. So much surfing lately! All of the cool kids are doing it. I want to post this soon, but check out Miso's video of Wizzy surfboarding on a Klein bottle co has just made! So rawks! I laughed, I cried, it became a part of me. http://youtu.be/ydz1hwst9O0 Warning: Prepare to be deeply moved! Miso's soundtrack is DE SHEET so turn it up loud.